Model NP35A. 23-Gauge Micro Pin Nailer - NP35A. 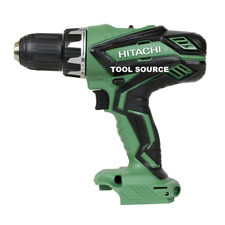 Hitachi 1-3/8 in. 23-Gauge Micro Pin Nailer. Reload indicator gives an easy visual recognition of low nail quantities to avoid dry firing. Fastener Gauge 23. Up for sale is a pre-owned Hitachi G12SQ Corded 7.4A 4-1/2" Angle Disc Grinder. The grinder has been tested and works great. Hitachi G12SQ Corded 4-1/2" Angle Disc Grinder. The lightweight and compact design of the tool allows for enhanced maneuverability and use even in congested places. The motor has a 2-piece magnet design capable of dissipating 400 in-lb of max torque for tackling the toughest of tasks. Hitachi C 7D Circular Saw 24V - Tool Only - NICE!!! - FREE SHIPPING!!! Used but still in good condition. Hopefully the pictures speak for themselves. Aluminum is crimped into the unilok grooves of the shaft to prevent unscrewing. NR83A2 Strip Nailer. NR83A 3-1/4" Full Head Nailer. NV75A Nailer. NR83A3S Strip Nailer. NR83A3 Strip Nailer. Aerospace grade #2024 Aluminum piston. 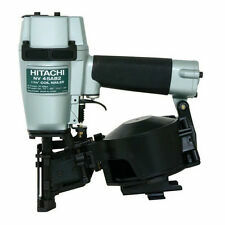 Hitachi NV45AB2 7/8" to 1-3/4" Coil Roofing Nailer. Drives 7/8 - 1-3/4 in. Standard roofing nails. Rubber pads help to prevent the nailer from sliding off of the roof when not in use. Integrated air duster button allows air from the compressor to bypass the nailing function and expel air from a hole in the front of the nailer allowing the user to clear away dust and debris from the work surface. Model: WH10DFL2 / DS10DFL2. The variable speed trigger makes loosening or tightening small screws, self-tapping screws, nuts and bolts a breeze. It features a convenient LED light to brightly illuminate any dark work area. 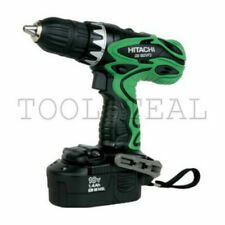 HITACHI DS18DVF3 18 Volt 1/2 inch Cordless 18V Drill Driver Genuine Tool. Condition is Used. Shipped with USPS Priority Mail. Sold as-is, works great! Any questions message me, this drill does not come with a battery! Trending at C $62.35eBay determines this price through a machine-learned model of the product's sale prices within the last 90 days. Left-mounted slide switch with quick-off feature for added safety. Includes 5 FREE Grinding wheels! 6.2 Amp motor with 980W of max output power for tough grinding jobs. This revolutionary professional impact incorporates a third anvil for ultimate torque, less vibration and faster tightening speed. 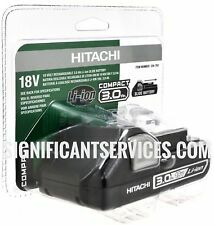 (1) Hitachi BSL1815S 1.3Ah 18V Lithium Ion Battery. 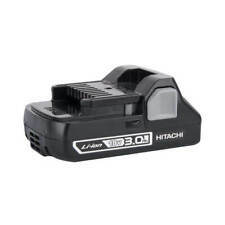 Hitachi BSL1815S 1.3Ah 18V Lithium Ion Battery. NT50AE2 2" 18-Gauge Brad Nailer Kit. Model #: NT50AE2. The NT50AE2 2" 18-Gauge Brad Nailer is ideal for trim work, furniture building and other finish applications. It accepts finish nails from 5/8" in length up to 2". I see zero evidence of this drill ever being used. Youll be really happy! 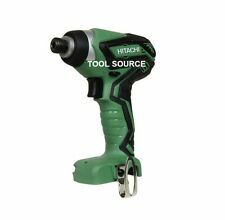 Hitachi NT65M2S 2 1/2" 16 Gauge Finish Nailer! !